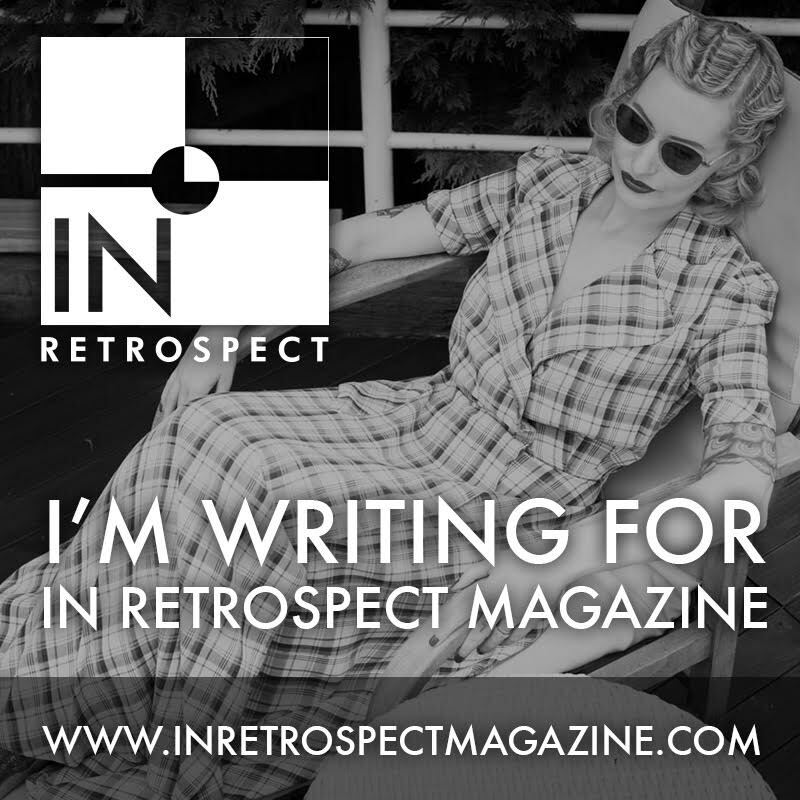 Hello vintage lovers! Have you made any Spring purchases yet? No? I am always a bit slow, waiting for the first lot of sales generally before I make any vintage-inspired purchases from the good old British high street. My guilty pleasure is supermarkets though - their prices make an injection of fashion much more affordable, and more economical time-wise if you can do your weekly food shop at the same time! 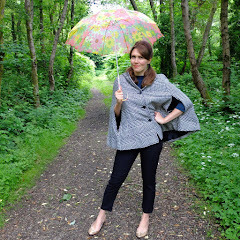 I recently popped to Sainsbury's to see what vintage inspiration they might offer. Here is what I found - from the ill-fitting to the super stylish. Take heed of my words and you need not do battle with the changing rooms. 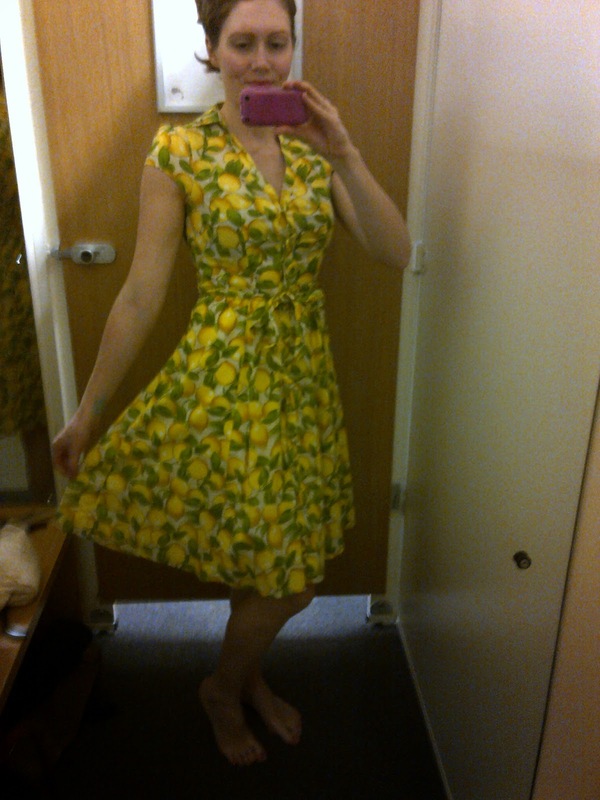 Excuse the lighting - I went into a well-lit changing room first, but the door didn't close, so I had to swap! 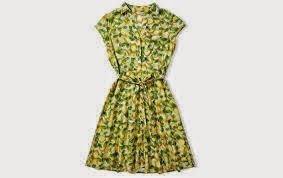 I absolutely loved this Dolce & Gabbana inspired dress with its zingy lemon print (do you remember D&G used this print a few seasons ago? On shorts and matching tops I believe). This dress is a super lightweight cotton, lined on the bottom, and I love the easy to wear style, with the button front and tie waist. It's a steal at £18. I didn't buy as I felt as I was inbetween sizes - the bust was too tight on this one, but the next size up was too 'blouson' on top. It's a good length, hitting my knee on my 5'9" frame. I'm not sure yellow this strong is my colour either, so I don't regret leaving this one behind. Capri trousers; they are such a summer wardrobe staple for those in love with 1950s and early 1960s fashions. Sainsbury's had a couple on offer, but the fit was disappointing for those of us with more 'vintage' figures, (with a higher hip to waist ratio) or those in search of capris that fit on the waist rather than below it. Daisy print jacquard trousers, £18 - absolutely terrible fit on me, with gaping pockets giving the impression of saddlebags, and I couldn't even zip 'em up! Avoid if you have feminine curves, these are for 'straight' figures, or perhaps the more petite. 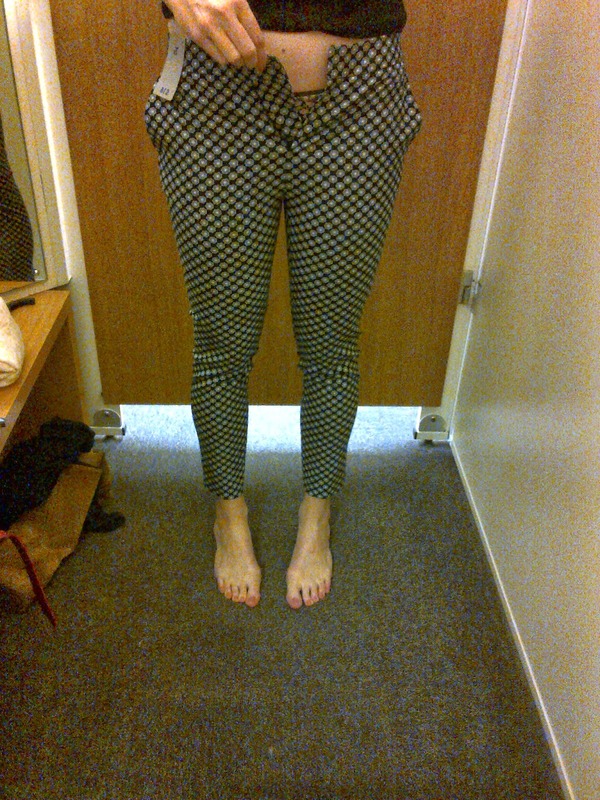 These polkadot trousers with their side zip, were very close, but no cigar - still ever so slightly too low-waisted on me, and I couldn't zip them all the way up. Again, if you are shorter than me (5'9") you may fare better with these, as they are a really lovely deep navy with tiny white polkadots, and only £15 ish I think. I spotted some fab pin-up style halterneck tops, in black, bright yellow, and turquoise. Only £8 each, so I picked one up in black, as I can wear with red cropped jeans and wedges for a rockabilly evening look, or tucked into a full '50s style skirt. 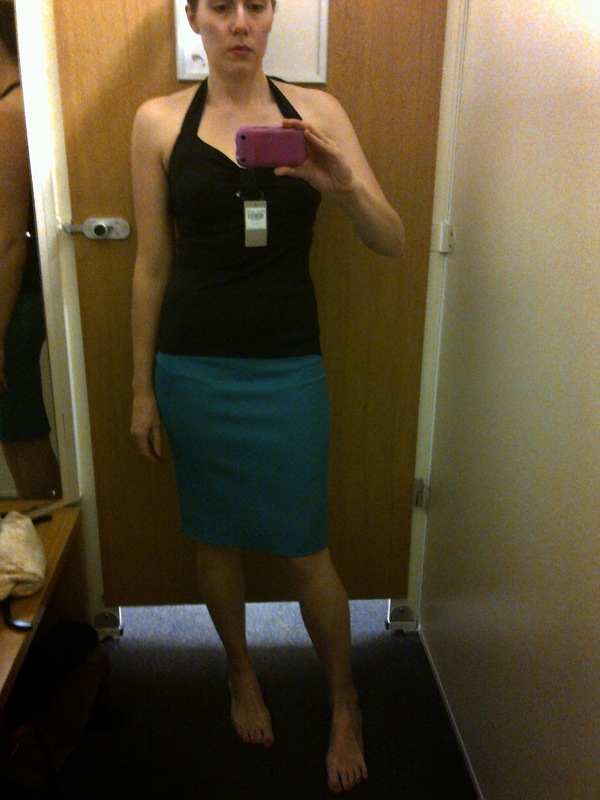 I didn't buy the jade pencil skirt (again around £16 I think), it wasn't a bad fit to be honest, fitting ok around both waist and hips (rare! ), but the length wasn't quite long enough on me, and it has a sort of embossed snakeprint effect, and my other half is scared of snakes! 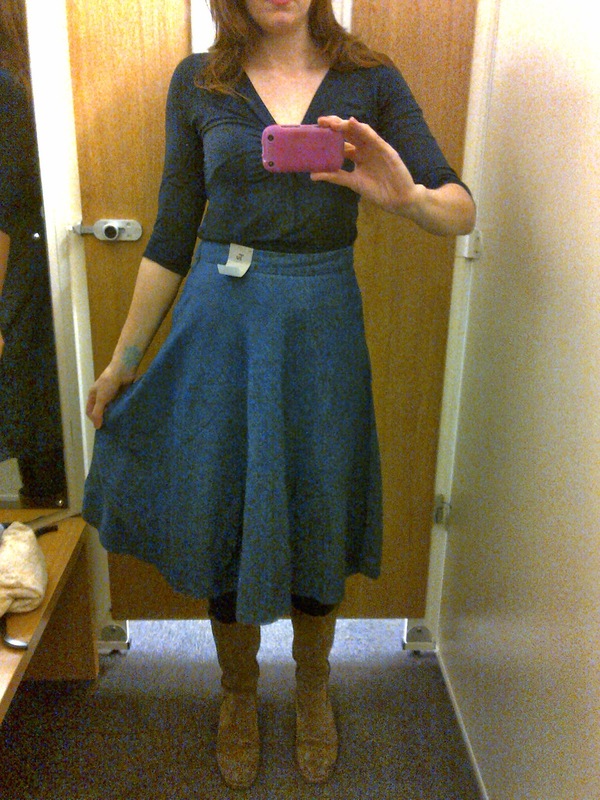 Next I tried on a denim midi skirt, which wasn't flattering at all on me, it was a thin denim that just sort of hung there limply, and I think you'd need a petticoat underneath to give it some structure. Also the waistband was flimsy, folding over on itself a bit, which was annoying. It was £18 in case you're tempted. 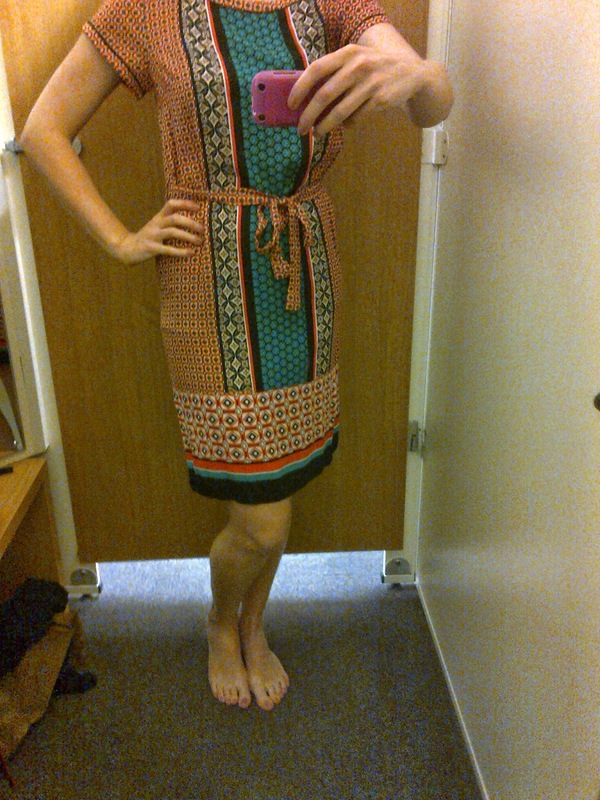 Finally, I tried on a fun printed tunic, quite a '60s or '70s vibe to it. The fabric is a really lovely silky viscose that drapes nicely. Could see this paired with a big floppy hat and wedges. Nice, but I couldn't justify it so left this one too. Price was again in the £14 to £18 range, can't remember exactly. After my Sainsbury's trying-on session I popped to the Clarks outlet and found these amazing 'Dollar Craze' yellow heeled sandals, with again quite a '70s vibe to them. Alas, half a size too small for me! I shall be stalking Ebay for them, already tracked down some size 7.5 pairs in France(!) 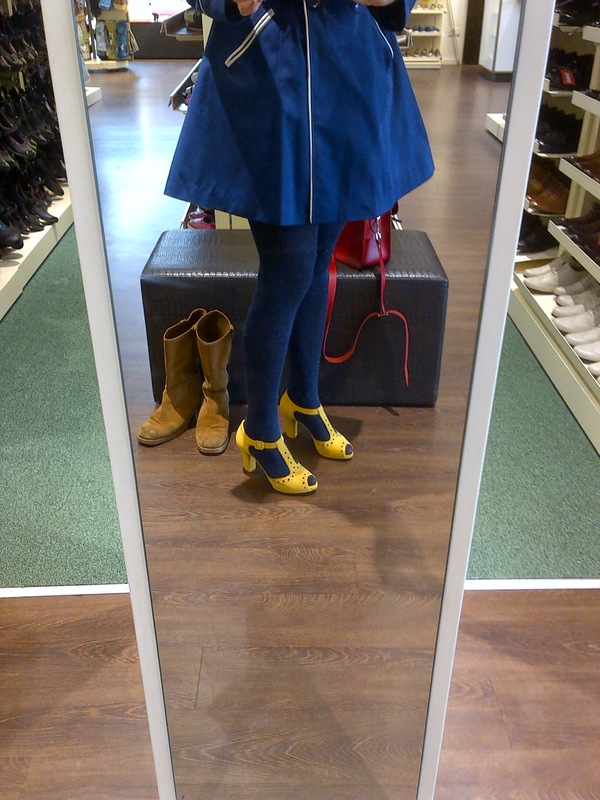 in yellow, navy or mink, but they're £54.99 instead of the outlet price of £39.99. Hmm... What do you think about yellow shoes? My other half said that you shouldn't wear them if you were over the age of 5!! I like the navy ones too. Have you done any shopping for clothes at Sainsbury's recently? Do you shop for clothes in supermarkets?? I adore those yellow shoes! Also I loved that first dress. I can be found browsing our local Loblaws that carries Joe Fresh. It is terrible. I can't get away from shopping for clothes anywhere now it seems. I don't know what is going on with Sainsbury's clothes at the moment, they were always my go to for leggings but they have now made them low rise on the waist!?! I hate low rise trousers anyway and in leggings it's just damned uncomfortable. I think the yellow shoes are gorgeous and you should most definitely buy them if they come up at the right price, they are much more striking than the navy ones, you can see the detail better. I like yellow shoes, too! I have a pair of yellow flats I love breaking out in the summer, and those heels you found are really great, too! Also, I love the dress at the top. It's so vibrant. I used to do a lot of shopping at stores like this, but I kept running into the same problem that you and and another commenter have mentioned: the fit just doesn't work for me. I tend to need garments that are high-waisted or a little more structured than the average store tends to carry. That doesn't mean I don't still stop and look every once in a while, though!! I am so in love with those yellow shoes I can hardly type! I'm off to souce a pair! Not a one yet myself and I highly doubt there will be many this year, as my finances need to go to other more pressing things than my wardrobe (which objectively, isn't lacking in most areas) at the moment. If I was buying though, I'd be shopping for wedge sandals, vintage blouses, and pencil and a-line skirts in hues I don't currently own any in. Too bad the first dress and the polka dot trousers with side zip didn't work out for you. I thought they looked great on you! Hi Porcelina, I don't know how you walked away from that first yellow dress - it was my favourite garment! Where I live vintage, second hand and thrift practically do not exist, so I have to shop whenever I travel. In fact I just uploaded a post on what vintage/second hand items I purchased - and yes, I have a pair of yellow shoes that I wear a lot. Great post! 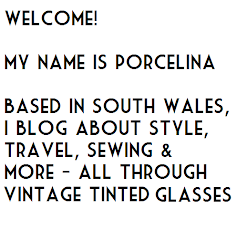 Thanks for linking up for Passion For Fashion!